"This is a historic visit. We are forging a big alliance here with a huge power," says Netanyahu after meeting Jair Bolsonaro. Prime Minister Binyamin Netanyahu met on Friday in Rio de Janeiro with Brazil's President-elect, Jair Bolsonaro. 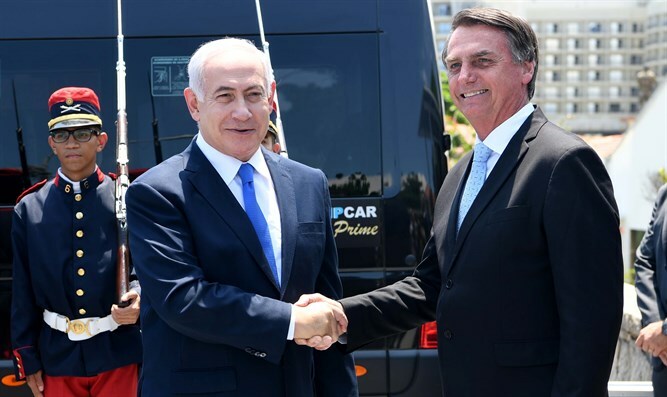 During the meeting, Netanyahu invited Bolsonaro to visit Israel. After the meeting, Netanyahu said, "This is a historic visit, the first time an Israeli prime minister has visited Brazil. We are forging a big alliance here with a huge power of nearly a quarter billion people, which is opening a new page with us, with cooperation that will help citizens of both countries in economy, technology and security." Netanyahu’s visit centers on the inauguration of Jair Bolsonaro as Brazil’s new president on January 1 in the country’s capital city, Brasilia. Netanyahu later hailed Bolsonaro's announcement. Arab leaders, however, have condemned the move and have pressured Bolsonaro not to go through with it.